SCIENCE + LOVE = BEER! 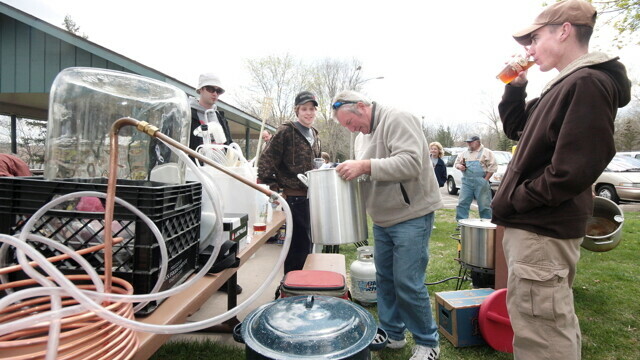 A previous Big Brew event held in Eau Claire's Mt. Simon Park. Whenever I tell people I brew my own beer I get very mixed reactions. Most people are surprised that someone without access to a brewery full of equipment even has the ability to brew beer, and others ask if it’s even legal to do so. Today I’m gonna to show you that brewing is not only completely legal, but one of the fastest growing and most fun hobbies around. If you ask a home brewer why they began making their own suds you’ll probably get answers as varied as the people themselves, but if you look at the popular trends in food and drink in America you might find you answer. People are gravitating towards do-it-yourself hobbies to save some money, be more eco-friendly, and get their products just the way they want them. Activities like gardening, home bread and cheese making, and backyard chicken coops are on the rise just as home brewing is. We’re starting to figure exactly what we want in food and drink, and the best way to get that is to make it yourself. If you need further evidence of the rise of home brewing look no further than Cap N’ Corks in Eau Claire. Caps N’ Corks offers everything needed to break into the world of home brewing and a helpful staff to show you what you need. For beginning brewers they offer a wide variety of kits so you can make your favorite style of beer. For the more advanced brewers they offer a variety of extracts and specialty grains so you can fashion your own concoctions. In addition to offering the supplies to make your own beer, Caps N’ Corks hosts a variety of contests and events centered on brewing beer and wine. They also offer a forum where local brewers can trade beer and equipment. While Caps N’ Corks is a great resource for beginners it’s not the only place in the area for home brewers to turn. The Chippewa Valley Better Beer Brewers Club has been active in Eau Claire for more than 20 years and is always looking to help out people new to brewing beer, wine, and hard ciders. The club is currently run by Bob and Tami Schraufnagel and has around 30 members. Meetings are held at members’ houses every month and include tasting, socializing, and a contest decided by a blind taste test. According to Bob, the club has experienced an increase in growth over the past few years and even had one of the founders of Lazy Monk Brewery start out in the club. In honor of National Homebrew Day this past May, the club put on Big Brew, a beer brewing and tasting event that took place in Phoenix Park. The CVBB encourages anyone interested in getting started brewing to stop by a meeting, as members are always willing and eager to help you figure out what you need to get started. Visit their Facebook or website (CVbetterbrewers.org) for more info. With all the local resources available, anyone with an interest in home brewing has all they need to get their own basement breweries up and running.